The 4R Nutrient Stewardship Certification Program has announced that Crop Production Services, Inc.’s facility located in Attica, Ohio has been added to its growing list of nutrient service providers to achieve certified status. The voluntary certification program is a concentrated effort by the agriculture industry to improve nutrient use efficiency and reduce nutrient loss. Excessive levels of nutrients in Lake Erie have been cited as a contributing factor to algal blooms. Crop Production Services is a major retail supplier of agricultural products and services in North America, South America and Australia. CPS’s strategy is to provide the crop inputs and services needed to feed a growing world. The company focuses on maximizing shareholder returns by driving continuous improvements to its base businesses, pursuing value-added growth opportunities across the crop input value chain and returning capital to shareholders. The Attica CPS location is a full-service agronomy terminal providing a full range of products, sampling and analysis, as well as precision agriculture services such as GPS grid soil sampling, variable rate custom application, layered data analysis and more. The location serves as a supply chain to a large portion of Ohio’s orchards vineyards, garden markets and “Muck Ground” producers in northern Ohio specializing in fruit and vegetables, and as a terminal for other CPS locations across the United States. CPS Attica has two Certified Crop Advisers on staff, five full-time crop consultants and a full-time precision ag specialist. It is the first of more than 100 CPS locations in the tri-state area to receive 4R Certification. “We strive to be good stewards of the environment, educating our staff and customers with accumulated research, ongoing updates and industry advancements to ensure, together with our growers, we maintain and improve our environment for ourselves and our future,” said CPS Precision Ag Consultant Kate Welch. More than 1.1 million acres and 3,040 farm clients are serviced by those who have received 4R Nutrient Stewardship Certification, with 60 percent of them being in the Western Lake Erie Basin. “CPS Attica’s employees worked very hard to ensure that its operations were following the 4R’s, and we congratulate them for their stewardship practices and success,” said Andrew Allman, executive director of the Nutrient Stewardship Council. “By becoming 4R Certified, CPS Attica has proven its dedication to the long-term improvement of Lake Erie’s water quality,” said Carrie-Vollmer Sanders, Nutrient Stewardship Council chairwoman. “We are proud of all nutrient service providers that have begun the process of becoming 4R Nutrient Stewardship Certified. MEDIA: Download a high-resolution photo of the CPS Attica facility receiving its 4R certification sign. 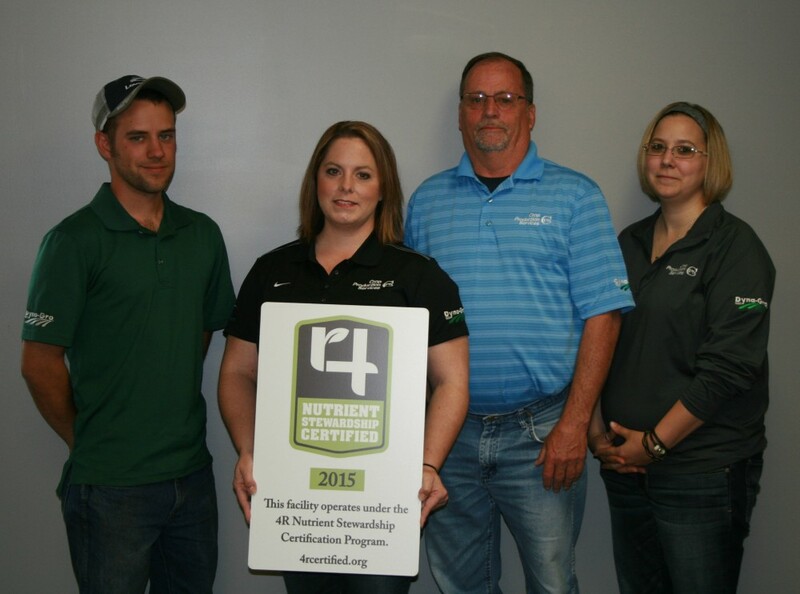 PHOTO CUTLINE: Employees of CPS Attica receive the facilities, 4R Certified sign. Pictured from left to right: Eric Eberhard, crop consultant; Kate Welch, precision ag consultant; Don Waldock, plant manager; and Julie Drown, office assistant.